6.How can the North East retain and attract ahigh-skilled workforce? The North East has historically been considered a ‘low-skills’ region, with low levels of formal qualifications among the adult population and a record of ‘exporting’ much of its brightest talent. This is now changing, with positive indications that the region has the potential to become a significant hub for professional and technical skills. This is the second in a series of three reports ‘Rewiring the North East’, which challenge common assumptions about the region’s economy and highlight ways in which it can play a critical ‘hub’ role in relation to wider northern and national prosperity. This is the second of three reports entitled Rewiring the North East. Together these challenge common assumptions about the North East economy, and examine how the region can play a critical role as a ‘hub’ within the north of England and the UK. The first report, At the Crossroads, examines trade flows from the North East to key destinations in the EU and the UK. Our findings confirmed its strong reputation as an exporter, but also identified the concentration of goods exports in a fairly narrow range of industries. Specialisation in the manufacture of road vehicles, pharmaceuticals, and organic chemicals underpins impressive export performance and is a testimony to the ability of the region to attract, retain and grow investment. However, a lack of diversity in the range of goods exports could leave the region vulnerable to shocks in the global economy. Strategies for economic development must seek ways for the North East both to maintain its excellent profile as an exporter, and to diversify and innovate in its range of exports. This report explores how the North East can act as a ‘hub’ for growing the skills base to boost its future economic performance. Its residents need the right opportunities to learn, train and retrain to meet current and future skills needs, and as the population ages the North East must also attract skilled workers from elsewhere. Success will help to build up the ‘ecosystems’ which sustain a vibrant and diverse business population. This includes the establishment of head offices as well as manufacturing plants and ‘satellite’ service centres, and an increased concentration of research and development functions. The region also needs new businesses to start up and grow, with their roots and a strong ongoing ‘stake’ in the North East (Potter 2010). Historically the North East has had a reputation as a ‘low-skills’ region, but this is changing as younger people engage with education and training, and – to a lesser extent – as the older population takes up opportunities to update or add to their qualifications. Current trends in the region are positive. Private sector investment in skills development has risen, and supports numerous formal collaborations with education providers. The aim is both to reskill established workers and to build the skills base among younger people. Such partnerships support the development of a skilled population and thus make the region more attractive to businesses. The 2015 devolution deals for the North East and the Tees Valley passed control of skills development in post-compulsory education and training to the combined authority (NECA). This means that stakeholders in the North East itself will be in a position to respond swiftly and flexibly to emerging skills needs, and also to forecast these in detail at the regional and subregional scale. To take advantage of this, the relevant bodies will need access to good-quality data on current and projected skills needs, and to effective networks in the business, training and education sectors. For these to be as effective as possible, a clear framework for articulating and examining skills needs is also necessary. ‘Skills shortages’ are frequently bemoaned in informal discussions and cited as the cause of various economic challenges, from poor productivity to difficulties attracting investment. Yet an examination of the available data and discussions with business and education leaders suggests that the situation is in fact more complex. The pervasive view that there is ‘a skills shortage’ may both divert attention from gains and highly successful examples of good practice, and mean that genuine, but geographically or sectorally concentrated, pockets of real deficit may be missed. The North East has a number of strong assets for developing its skills base and boosting its research and development capacity. Its universities do well in attracting students from elsewhere in the UK and across the world, to a mix of qualifications and subjects which corresponds well with its aspirations for business. They also have a strong history of widening participation, which suggests that the potential of local students is being well used. In addition, graduate retention within the region is relatively good. To sustain this and to attract both graduates and vocationally qualified workers, investment in research and development and in business growth is needed. The region’s ability to compete on cost of living and quality of life with London is clear, but it also needs to compete with the rest of the North and other parts of the UK. The relationship between higher skill levels and innovation within a regional economy is relatively little explored, but what research there is suggests that the two are linked. This is not surprising. Innovation which drives changes in workplaces and in the range of jobs available is likely to demand workers who can adapt to new technologies and ways of working, and are prepared to engage in ongoing upskilling and lifelong learning. In turn, concentrations of expertise within a workforce may help to drive innovation. This includes skills for research and development functions, such as high-level STEM analytical abilities, but also skills which help create a wider ‘ecosystem’ to foster the birth and growth of new enterprises (such as capacity in business services and creative and marketing occupations). 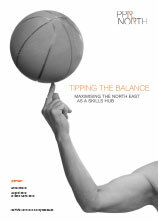 Chapter two of this report surveys the current landscape of skills in the North East population. This sets the context for an examination of what skills need to be developed and attracted from elsewhere. Current skills needs and their assessment are considered in chapter three. Chapters four and five address the part played by higher education and vocational training in helping the North East to act as a ‘hub’ to draw in, develop and hold onto the skills which it needs for growth and the transformation of its economy. Chapter six discusses how this transformation itself will help perpetuate a highly skilled population, and chapter seven sets out our recommendations to support these changes. Historically the North East has been considered a ‘low-skills’ region, in which a high proportion of the adult population do not hold formal qualifications. The available data supports this to some extent although there are marked differences between age groups. Even more stark are the contrasts between local authority areas within the region. At the time of the 2011 census, 26.5 per cent of the North East population aged 16 and above had no qualifications.1 This is the second highest figure for any English region, at 0.1 percentage points below that for the West Midlands. It is also slightly higher than the North West (24.8 per cent), or Yorkshire and the Humber (25.8 per cent), and considerably higher than London (17.6 per cent). The North East also has the lowest proportion of residents qualified to Level 4 (equivalent to an undergraduate degree), at 22.2 per cent. Elsewhere in the North and Midlands the figure is between 23.3 per cent and one-quarter, while in London it is 37.7 per cent. In the South East almost 30 per cent of the population is qualified at this level. The more detailed analysis of census data2 reveals that the North East has a lower proportion of graduates in its post-16 population than any other region, at 12.5 per cent; this compares to 13.9 per cent in Yorkshire and the Humber and 14.5 per cent in the North West (the figure for England as a whole is 17.4 per cent). However, this level of analysis indicates that it has the highest proportion of people with an apprenticeship qualification (8.4 per cent, compared to 6.3 per cent for England as a whole), and also of people who hold a vocational qualification at Level 4 or 5 (4.9 per cent compared to 4.4 per cent for England as a whole3). To some extent this may reflect the type of training which its older residents accessed, but the figures for the 16–24 and 25–35 age groups are still higher than in other regions. As discussed in more detail below, this suggests that new forms of employment-related training are particularly attractive to North East residents. Younger people in the North East are substantially better qualified, reflecting increased participation in higher education and a growing range of opportunities to undertake vocational training. Among those aged 16–64 (that is, when the oldest age group are excluded from calculations), just 17.8 per cent have no qualification – although this is still the second-highest figure for any English region (ONS 2014) (see figure 2.2). At the time of the 2011 census just 11 per cent of those aged 16–34 had no qualifications, compared to 30 per cent of those aged 50–64. More than one-third of people in their late 20s and early 30s hold a degree or equivalent. Even so, the North East still lags behind other regions. For example, among people aged 24–34 only the West Midlands and Yorkshire and the Humber had a higher proportion with no qualifications, and the figure of 11.1 per cent is considerably greater than that for London (at 6.9 per cent) or the South East (at 7.1 per cent). There are also substantial variations within the North East. Figure 2.3 shows the percentage of population with each highest level of qualification, for North East local authorities. Qualification levels in Newcastle are the highest in the region. The city has a higher proportion of graduates than its neighbours and, indeed, than many other major cities. Almost half the population (47.7 per cent) have a Level 3, Level 4 or Apprenticeship qualification, a higher proportion than in any other English core city except for Bristol or London. And less than a quarter of the population aged 16 or above (23.6 per cent) have no formal qualifications; this is a lower figure than for Liverpool, Sheffield, Nottingham or Birmingham, and only slightly higher than Manchester or Leeds. By contrast 30.7 per cent of people aged 16 and over in Hartlepool do not hold a qualification; the rate is only slightly lower in Middlesbrough (29.9 per cent), Sunderland (29.1 per cent), Redcar and Cleveland (28.4 per cent) and Gateshead (28 per cent). These figures are comparable to other smaller cities in the North, and to areas without a major urban centre. For example, in Wakefield, Doncaster, Rotherham and Barnsley between 29.8 per cent and 32.3 per cent of the population aged over 16 have no qualifications. Around 40 per cent of residents aged 16 or above in North Tyneside, South Tyneside, Darlington and Northumberland are qualified at Level 3 or above. The figures are far lower for other parts of Tyne and Wear: 38 per cent in Gateshead, 37.4 per cent in South Tyneside and 35.2 per cent for Sunderland. In the Tees Valley the figures are 37.8 per cent in Redcar and Cleveland, 36.1 per cent in Middlesbrough and 35.6 per cent in Hartlepool. Forecasts suggest that more than three-quarters of the jobs created over the coming decade are likely to require skills equivalent to those gained through a qualification at Level 3 or above (Cox and Raikes 2015). Thus, parts of the North East region could be less well-placed to attract, or to benefit from, investment and job creation. There is also a real threat that certain parts of the region could be ‘left behind’, leading to inequalities within the North East. If the region is to attract different kinds of employment and employer it must continue to shake off its reputation for poor qualification and skill levels. It still suffers from some degree of ‘low skills equilibrium’ resulting from the mobility of highly skilled workers and the failure of certain local economies to attract and retain them (Schmuecker, Baker and Henderson 2013: 13–14). Graduates are traditionally classed as ‘highly mobile’, but increasingly people with high-level production and technical skills are in demand and may enjoy similar opportunities. Overcoming this in the North East will involve increasing levels of engagement with education and training, and also demonstrating that the region can compete in the offer which it makes to skilled workers. The location of ‘demand’ for skills development and training opportunities has shifted over the past decade. For a long time these were seen as relating to the ‘demand’ from potential applicants, as young people made a personal choice about their careers. More recently the focus has been on the demands of employers for particular skillsets and types of employee. This is now a strong theme in policy for vocational training, and its impact on higher education is growing. The new approach offers a better prospect for matching skills development to the needs of business, and to the supply of jobs. However, this shift demands different kinds of engagement between employers, education and training providers, and those seeking opportunities to develop their skills. Young people and established workers who are keen to enhance their prospects require high-quality, specific and precise communication about skills needs and how to meet them. In the North East, employment rates for people with higher qualification levels compare well with the national picture. However, those without qualifications or qualified only at Level 1 fare poorly.4 The most recent available data (for 2011) shows that seven of the North East’s local authority areas have rates of employment for workers with no qualifications which are among the 25 lowest in the UK (out of 347); the national (English) rate of employment for this group is 48.5 per cent. However, only four North East local authorities have employment rates for people with Level 3 qualifications or for graduates which are among the lowest 100 in England. Overall employment rates for these latter groups compare favourably to national ones, as shown in Figure 2.4. In addition the disparity between employment rates for those with the lowest (none) and highest (Level 4) qualification levels tended to be higher in the North East than elsewhere. All but one of the North East local authority areas are among the 50 areas with the highest gaps. This suggests that qualifications are particularly important for people in the North East in gaining work. Workers and potential workers as well as employers can benefit from an increase in the level of skills and qualifications across the population. *Rank is out of 347, smallest figure indicates highest rate. The best skills development system in the world will have limited impact without engagement from potential entrants and the communities in which they live and – potentially – work. As noted above, young people need good information about what education and training is available to them, and how this can help them first into a job and then a career. This will both guide their choices, and determine how they value learning and invest their time and effort in the available opportunities. Research in the North East found that many young people did not understand the relationship between qualifications and their future job and lifestyle or more generally how education related to employment (Northumbria University 2003, Hutchinson and Parker 2009). Although this work was conducted over a decade ago, our interviews suggested that similar gaps in knowledge and understanding persist. A particular issue is the lack of a ‘lifelong learning’ perspective applied to initial opportunities. For young people whose parents spent only a brief period in training and then entered what was effectively a job ‘for life’, the idea of more proactive career planning may seem alien. Nevertheless a shift towards careers guidance which uses a ‘lifecourse’ approach is important given the pace of technological and labour market change, to say nothing of the likely extension of working lives for people now entering the workforce. Transitions between engagement in training and further education and work are not necessarily smooth, particularly for people from deprived communities and areas where some of the jobs available are relatively low paid, low skilled and insecure. Shildrick and MacDonald (2007) found that young people growing up in the poorest neighbourhoods of the North East were likely to enter opportunities for further learning, but also to leave early. Their experiences were often curtailed and viewed as negative, especially if they did not find work, or better work than before. This in turn could influence future judgments about the usefulness of taking up training or education. Parental approaches to education are important, as is engaging parents in an understanding of the opportunities available to their children. The beliefs about education and employment that are transmitted within the family and the community surrounding young people may be more important than official messages from schools or other institutions (Archer et al 2005). Where parents themselves have relatively low levels of education and a narrow knowledge of job markets, the decision to abandon ways of working and learning which are strongly embedded in family and social cultures may be difficult for their sons and daughters. Choices which involve moving away from the parental home, even by a relatively short distance, could also be problematic. Simply ‘wanting the best’ for one’s children does not necessarily mean that parents will be well informed or in a position to support the decisions which will most increase their prospects of more secure employment or higher earnings, or best serve the local economy (Hutchinson and Parker 2009). Many initiatives in education and employability have stressed the importance of ‘raising aspiration’. Yet our interviews suggested that training in technical and production skills may continue to carry a stigma of preparing people for ‘factory work’ with limited prospects and low prestige. This may make it difficult to recruit young people to training in these areas, despite an ongoing need. Once again ‘lifecourse’ approaches to careers advice may be helpful here, stressing both the changing nature of manufacturing (in terms of the nature of the work and the opportunities open to workers), and also the possibility of changing direction or achieving promotion through further learning in mid- or even late career. Persistent gender stereotyping is also a problem. The recruitment of girls and women to STEM subjects and engineering roles remains poor, reducing the number of potentially available workers and also the range of experience brought into the field. Some interviewees also noted the advantages of mixed (rather than male-only) groups in training and the workplace. Transport is often discussed as an ‘enabler’ of business, but it is also vital in access to learning. This is particularly true where the potential learners may not have their own vehicle, or are unable to afford expensive fares. Location is especially important for compulsory education, because the logistics of getting children to schools can impact on a whole family. The ease and costs of transport access for potential learners, in the context of their family circumstances, need to be considered when planning training opportunities. Collaboration between employers in supporting skills development is important, and education providers and establishments can support this. A collaborative approach focused on developing a regional ‘pool’ of skilled labour offers the potential for employees to gain a more varied experience through seeking promotion outside their first organisation, as well as the advantages of shared sectoral learning. Programmes for skills development such as the ‘Employer Ownership of Training’ initiative will encourage a more collaborative approach. This also reduces the danger that labour market disruption might result from companies engaging in ‘arms races’ to attract skilled employees from one another, rather than prioritising training and development. 1 All data in this chapter is taken from Office for National Statistics analysis of the 2011 census except where otherwise stated. ONS data is accessed through the Neighbourhood Statistics and Nomis portals (http://www.neighbourhood.statistics.gov.uk/ and www.nomisweb.co.uk). 2 ‘Qualifications gained’ as opposed to ‘highest level of qualification’. 3 This figure is higher than the one in figure 2.1 because it indicates the proportion of the population who hold an apprenticeship qualification, rather than the proportion for whom this is the highest qualification held (that is, some of those counted in this higher figure may hold both an apprenticeship qualification and a degree). 4 Note that these figures relate to 2011, during which the North East was still recovering from the recession. For purposes of comparison the unemployment rate in the North East region at the time of the census was 9.7 per cent; by September 2015 it had fallen to 7.9 per cent. Anecdotal evidence, and indeed passionate affirmation, of a ‘skills shortage’ is profuse. This is true both for the North East and for England as a whole. However, the most recent available data (UKCES 2016) suggests that the North East actually has a lower incidence of skills issues than other parts of the country, and that rates of skills shortage and gaps in the region are not as high as might be expected. To some extent the gap between the apparent and actual positions could reflect the news worthiness of skills problems. A workforce with the skills it needs is not remarkable, but simply how things ‘should’ be. Informal discussions and comments suggest that it is not difficult to find at least some employers who report that they have heard about problems with skills, but encountered few within their own workforce. Vivian et al (2016: 11) found that 6 per cent of establishments in the 2015 Employer Skills Survey had vacancies which were classified as being due to skills shortages, and that 23 per cent of all vacancies identified in the survey were ‘skills shortage’ vacancies. This represents a rise from 3 per cent of establishments and 16 per cent of vacancies in 2011. It is clear that businesses are encountering, or at least perceiving, more difficulties in obtaining the skills which they need during recruitment. Higher overall levels of employment may play a part in this shift, as skilled employees find it easier to obtain work and thus the pool of applicants is reduced. However, within the established workforce, the incidence of skills gaps appears to have fallen: in 2015 around 14 per cent of employees were considered to lack all of the skills needed to do their job, compared to 17 per cent in 2011 (ibid). Skills shortages and gaps are certainly concentrated in particular types of role and sectors of employment. Interviews for this project confirmed the findings of Vivian et al (ibid: 12–14), which suggest that rather than ‘across the board’ difficulties there are pockets of skills issues which pose a problem for certain industries. Skills gaps and skills shortage vacancies are particularly marked in ‘unskilled and semi-skilled occupations’ (ibid: 13), while there are skills shortage vacancies also among professional and skilled manual roles in particular sectors (ibid: 12). Some interviewees suggested the focus on the skills of current school leavers and graduates may not necessarily pinpoint the main locus of the problems encountered by employers. Rather, it may be the skill levels of workers in their late 30s and their 40s which cause greatest concern. This group undertook their initial training at a period when access to and options within vocational education were more limited than is the case for today’s young people. Different companies will view skills gaps and shortages in different ways, with some accepting that staff are likely to need training in order to accommodate changes in their work and role, or to become a good ‘fit’ for a particular company. Others may feel that education and training systems and staff themselves are responsible for presenting business with what were once controversially termed ‘oven ready graduates’ and other employees (Brown and Hesketh 2004). Vivian et al (2016: 11) found that two-thirds of employers in the UK provide training to their employees; this proportion has remained almost unchanged since 2011, although the proportion of the workforce receiving training has risen from 55 to 63 per cent. However, the distribution of training is uneven. It is more likely to be provided in larger companies, and in public service sectors (around 90 per cent of employers in public administration, education, health and social work) rather than manufacturing (62 per cent of employers), construction (58 per cent), transport and communications (61 per cent), and the wholesale, retail and hospitality sectors (around 60 per cent) (ibid: 193). Training is most likely to be offered to staff in ‘caring, leisure and other services’ roles (around 80 per cent in 2015), which may reflect its heavy use in education, health and social work. Professionals are also likely to receive training (69 per cent did so in 2015), as are associate professionals (62 per cent). By contrast only just over half of machine operatives (54 per cent) and elementary staff (56 per cent) received training in 2015, despite high incidences of skills gaps and shortages in these occupations. The most common barriers to providing training all relate to resources, such as lack of funds (52 per cent of employers), limits on staff time (49 per cent) and difficulties finding time to organise training (14 per cent) (ibid: 113). This data points to a need for improved skills development opportunities. However, even a workforce with no skills shortages or gaps would still require training and skills updating over time. Skills gaps arise when staff enter roles which are unfamiliar to them (around 60 per cent of skills gaps were attributed to this role in 2015), but also when working practices or equipment change. Vivian et al (ibid: 63) found that 28 per cent of skills gaps arose from new working practices, 20 per cent from the introduction of new technologies, and 19 per cent from the development of new products and services. In other words, shifts in the labour market and innovation are important drivers of the need for skills development. Organisations with responsibility for skills provision need the tools to make accurate assessments and forecasts of skills needs. Reactive approaches may be needed to meet very specific short-term deficiencies, for example where extremely rapid local technological changes or adjustments to products or ways of working are in place. However, skills are essentially a ‘slow burn’ issue and therefore good-quality, long-term projections are essential. It takes time to identify a skills need, design training, and resource both provision and participation. Most businesses can’t release their employees from work at short notice to take part in training, and jobseekers have limited time and funds to invest in their own development. The 2014 strategic plan for the North East local enterprise partnership (NELEP) included an important commitment to engage in skills forecasting and projections to support the strategic aims of the LEP in relation to skills and in particular planning of skills provision (NELEP 2014). An increasingly sophisticated suite of aids to facilitate work of this kind has become available. For example, metrics to analyse data from job advertisements posted online are now offered by companies such as ‘Burning Glass’ in the US and the ‘Where the Work Is’ online tool. This offers direct access to the practical and systematic ways in which employers articulate the skills which they need for the very practical purpose of getting more of them. Innovative approaches of this kind could be of great value in planning for economic development, alongside more traditional modes of forecasting. The most recent official forecasts for the North East labour market (UKCES 2015) suggest that private sector jobs growth in the North East local enterprise partnership area will be relatively high over the next decade, contributing around 94 per cent of jobs growth (compared to a national rate of 85 per cent).5 Within this the most important sectors are likely to be information technology, construction, and service areas including professional services, finance and insurance. Primarily public sector employment in health and social work services will also contribute to jobs growth. Over the same period, levels of employment in manufacturing and public administration (both currently overrepresented in the North East) are likely to decline. However, falls in the former area will be smaller than for the UK as a whole and ‘replacement demand’, or the availability of jobs as people leave the workforce, will maintain the importance of manufacturing to the North East labour market. Jobs in key growth areas, alongside the well-established manufacturing sector, demand relatively high levels of qualifications for the ‘knowledge economy’ and technical or production skills. Forecasts also suggest that both job creation and replacement demand will be strongest in ‘high-level’ jobs, an observation that reinforces the importance of ‘upskilling’. Net growth of 28,000 professional jobs is likely to be accompanied by 65,000 ‘replacement’ vacancies, all boosting demand for a better qualified workforce. The impact of this trend can already be seen; for example in 2011, 50 per cent of people employed in associate professional and technical roles were qualified to Level 4 or above, and only 15 per cent had a highest qualification at Level 1. For people aged 25–34 the equivalent figures were 60 per cent and 6 per cent. Qualification levels appear to have grown more important for new workforce entrants. With a projection that there will be ‘strong net growth’ in skilled work, the region must be able to develop and retain well-qualified people. At the same time lower-skilled work will decline, meaning that people who might previously have relied on work of this kind may need to improve their qualifications in order to obtain work. By 2022 around 20,000 fewer people are likely to be employed in ‘middle ranking’ administrative, secretarial and skilled trades roles. Sales jobs, which increased in the years leading up to 2012, are also likely to become fewer in number overall, although they will remain significant sources of employment and job openings will be relatively plentiful as older workers leave the workforce. The only lower-skilled areas where strong employment growth is forecast are caring and leisure roles. These, however, are increasingly professionalised and associated with specific qualifications. As well as employment projections, economic priorities should also play a part in planning for skills development. In the UK, and in particularly in the North East, the most important of these is surely to increase productivity (Cox and Raikes 2015, Colebrook et al 2015). Although skills development alone may not be sufficient to make a substantial difference to productivity (Keep et al 2007), it is an important part of the ‘mix’. So skills provision should also take account of the best evidence for relationships between workforce skills and improvements in this area. Overall the rate of skill shortage vacancies in the North East is similar to that for the rest of the UK. In 2015, 23.5 per cent of vacancies in the region fell into this category, compared to 22.6 per cent nationally (UKCES 2016). The proportion of the workforce whose employers report skills gaps among established workers is also similar regionally and nationally. Across the UK around 5 per cent of employees were judged by their employers to be ‘not fully proficient’ in their role, compared to 5.7 per cent in the North East (ibid). However, skills issues are concentrated in particular sectors, types of role or work, and geographical areas. Regionally and nationally, the density of skills shortages varies considerably between types of work, as demonstrated in figure 3.1 (over). Managerial, professional, skilled trade and machine operative roles have the highest rates of skills shortage vacancies nationally, as well as the most marked increase in skills shortage vacancies since 2011. This situation is even more pronounced in the North East, with professional roles presenting a particular issue. As with the rest of the UK, the North East has relatively high rates of skills shortage in skilled trades and machine operative roles. This broadly supports the view that newly created jobs increasingly demand high levels of academic or vocational qualification. The relatively high rate of skills shortage vacancies for these roles in the North East may reflect both general trends, and also a combination of historical skills issues in the region with changes in its industrial mix and the creation of new kinds of jobs. Given the importance of sales and customer service jobs in the North East’s economic recovery (see section 3.2), relatively high levels of skills shortage vacancies in these areas are potentially problematic. There is also variation between sectors. Vivian et al (2016: 42) found that among professional staff the highest rates of skills shortage vacancies were encountered in manufacturing, construction, transport and communications, business services, and health and social care; in all cases the rate is between 36 and 38 per cent. A similar mix of industries are affected in relation to skilled trades occupations, but in this case the density of skills shortage vacancies is even higher (at 52 per cent) in manufacturing and business services. Construction (37 per cent) and transport and communications (42 per cent) are similarly affected, while service industries (wholesale and retail, at 51 per cent, hospitality at 37 per cent, and arts and other services at 43 per cent) also encounter problems. The density of skills shortage vacancies among machine operatives in construction is 48 per cent, and in transport and communications it rises to over one half (at 52 per cent). Data on skills shortage vacancies by occupation and sector is not available at regional level, but it is reasonable to assume that the distribution of skills shortage vacancies in the North East follows a similar broad pattern. Skills gaps, or areas where current employees are not fully skilled for their jobs, are both less concentrated in particular sectors or types of role, and also less pronounced overall. Here the pattern for the North East is similar to the national one (see figure 3.2), but there are particular issues in machine operative, sales and customer service, and associate professional occupations. The most common reason for skills gaps in the North East, as in the rest of the UK, is incomplete training for staff who are new to their roles; this accounts for just over 70 per cent of skills gaps nationally. Innovation, in particular where this involves the development of new products and services, appears to be a particularly strong driver of skills gaps in the North East and the wider North (see figure 3.3). This data reinforces the need for good information about employer needs and business trends when planning skills development strategy and content. Once again, data on skills gaps by occupation and sector is not available at a regional level. Nationally, skills gaps among professional staff are fairly evenly distributed between sectors, although they are highest in manufacturing. By contrast, among associate professionals manufacturing has a relatively low level of skills gaps (5.5 per cent). For such roles the highest rates occur in hospitality, with a rate of 11.5 per cent; there are also more issues in construction, business services and public administration (all above 6 per cent). Among machine operatives, skills gaps are most common – once again – in manufacturing and hospitality (over 10 per cent in each case). Overall, skills gaps in the North East are more likely to relate to technical and practical skills, and knowledge and understanding than to ‘soft’ or ‘people’ skills; in the latter area, the position in the North East is very similar to that for the UK as a whole. However, the region has markedly higher rates of skills gaps in the former (see figure 3.4, over). Many of these relate to knowledge which is specialist to the role (and hence these issues may be resolved once training is completed), or to particular products and services. The latter, like the relatively high level of gaps in skills for ‘adapting to new equipment or materials’, may also reflect the skills gaps which arise due to innovation. However, the North East also has particular gaps in ‘complex analytical skills’, including solving complex problems which require a situation-specific solution, reading and understanding work-related documents, and adapting to new equipment or materials. These may reflect the importance of ‘underpinning’ skills which was raised by several interviewees (discussed in 3.4 below), especially for workers with vocational qualifications and/or in non-professional roles. Nationally machine operatives are particularly likely to lack skills of this kind; 48 per cent of skills gaps in these roles relate to reading, 40 per cent to adapting to new equipment or materials, and 26 per cent to complex numerical skills. Once again, these findings bear out the comments by several interviewees that jobs which previously would have required primarily manual and operational skills now require reasonably high levels of literacy and numeracy, and the ability to apply these effectively to workplace situations and to problem solving. In a review of the relationship between skills and innovation, Tether et al (2005) found that innovation drove demands for more and different skills in the UK economy, but that the labour market had by and large not met these effectively. In particular there was a shortage of highly skilled ‘technical’ workers of the sort who make up a substantial part of the German and Japanese workforces. It is reasonable to assume that regional skills demands may increase as current initiatives to boost innovation in the North East come to fruition and are reflected in the regional labour market. Following from this, there is a danger that if these needs cannot be met locally, jobs created may move to other regions or ‘offshore’, and the full benefits could be lost to the region. Skills and innovation are among the drivers of productivity, along with investment and enterprise (Camus 2007). The North East has seen greater gains in productivity than other parts of the UK during its recovery from the recession (NELEP 2014), but in this area it still lags behind the UK average. Skills are an essential part of building on this strong track record, and of closing the gap. As well as ensuring that the economy has enough skilled workers and minimal skills shortages and gaps, specific skills and ‘skills mixes’ are important. In STEM areas, workers need to be strong and confident in what one of our interviewees described as ‘gateway’ or ‘unblocking’ skills. These are the fundamental understandings of the science that lies behind particular techniques or processes, and which – in terms of worker performance – facilitate problem-solving, transfer of knowledge between contexts, and ultimately continuous skill upgrading (or ‘lifelong learning’). For example, in IT a programmer who knows how computer programmes ‘work’ will be of greater long-term value to an employer than someone who knows how to use just one or two languages. Among other advantages, such a high-skilled programmer has the knowledge to facilitate quick and ‘deep’ learning of novel languages in the future, and to deal with unforeseen problems when these arise in a particular programme. Similarly, engineers need a good grasp of fundamental principles in physics and related sciences to ‘take an engineering approach to the world’; while auxiliary health workers will be more effective if they have an understanding of basic biomedical science. Such skills are needed throughout a workforce. Staff in skilled, semi-skilled and routine roles are more likely to adapt to and adopt innovative working if they understand why established practice needs to change. This is crucial in eliminating inefficiencies, solving problems ‘at the front line’, changing approaches to maintenance, and so on. In fact flexibility and adaptability are important skills across the labour market. Workers with these characteristics may help sustain regional economies in tough times, as they are better able to shift into new jobs and types of work (PwC 2015: 37). The suggestion that ‘theoretical’ understanding may be applicable in non-professional work is well established in the ‘dual systems’ of training practised in highly productive economies such as Germany and Japan. These bring together learning of both kinds so that hands-on practical knowledge and experience is gained alongside ‘...a sound theoretical footing’ (ICF/GHK 2012: 3). A ‘strong’ version of this approach to training can leave employees lacking skills for problem-solving, adapting their abilities to new contexts, or grasping new ones quickly (Wheelahan 2012). Leadership and the ability to deploy skilled workers effectively are further ‘overarching’ skills which are needed to support innovation, and specifically to embed innovation in ways of working (Tether et al 2005). Skills of this kind could be a particular challenge for firms in the process of growing from an initial innovative startup into a larger business with multiple employees, or from a ‘friends and family’ organisation. They include market awareness and strategic planning, as well as general business knowledge. Startups are often highly specialised in their outputs and approaches and the ability to think beyond these is crucial. As well as managers, companies need skilled boards of directors who are willing to work proactively with CEOs and other staff. New entrants into the North East’s thriving export markets need additional skills. Among these are cultural competence and the ability to engage in extended work alongside people at all levels in businesses based elsewhere in the world. This is as important when setting up links with English-speaking and European nations as with Asia or South America. North East businesses need to complement development in this area with higher skill levels and a more diverse range of language skills. 5 All figures in this section are taken from the most recent UKCES Labour Market Intelligence reports for English LEP areas (UKCES 2015). Universities are important to regional economies in numerous ways. They increase the supply of skills, support product, process and service innovation through links with businesses and communities, and attract investment and talent (Universities UK 2015). In the North East, universities were estimated to have generated around 3 per cent of all regional GVA in 2011, and to have accounted directly or indirectly for around 2.76 per cent of all regional employment (Kelly et al 2014). A strong higher education base attracts able students and in turn contributes to regional innovative performance: as such, opportunities for work in innovative businesses then ‘… encourages university graduates to seek employment in that region’. Universities have an important function in attracting ‘high quality undergraduate human capital’ (Faggian and McCann 2004). The North East has five universities. Newcastle University is a long-established civic ‘redbrick’ institution, which received its charter in 1963 but dates back to a group of university colleges established in the early 19th century. It is a founder member of the Russell Group with a strong research reputation, and a member of the ‘N8’ group of ‘research intensive’ northern universities. Durham University was founded in the early 19th century, and is one of the few collegiate institutions outside Oxford and Cambridge, although its departmental structure means that it shares some features with a campus university. It joined the Russell Group in 2012, and is also an N8 member. Northumbria University received its charter in 1992, and represented the union of a former polytechnic with several colleges providing vocational education. Sunderland University received its charter in 1992, bringing together the old polytechnic with colleges including the city’s Art School (the National Glass Centre became part of the university in 2008). Teesside University received it charter in 1992, following multiple initiatives to convert the old Constantine Technical College (later Teesside Polytechnic) into an HEI. All three ‘post-92’ universities (Northumbria, Sunderland and Teesside) have extensive involvement in providing ‘higher education in further education’ through partnerships with local colleges, and offer degrees taught overseas through partnerships with international institutions. Several have additional campuses in London at which courses in business studies, IT and other vocational studies are offered to international students. Four of the five universities are within the NELEP area, the exception being Teesside which is the only university in the Tees Valley Unlimited area. Overall this represents a relatively low density of higher education provision, the second lowest in any English region; only the east of England has a lower ratio of HEIs to regional population. North East HEIs perform comparatively well in attracting international students. The number per HEI is the highest in the UK, at over 3,700, and the proportion of students who are international students is higher than elsewhere in the North, the East Midlands, or the South West (see figure 4.1). These figures indicate that the North East can attract a broad pool of talent to study in the region, outperforming some destinations which might be considered more attractive. However, current legislation relating to graduates’ employment after graduation could potentially lead to the region losing out on some of the knowledge and talent which it produces. This is particularly regrettable where non-EU students are engaged in innovative work which could benefit the region’s business or its ongoing research profile. It is also important that where students ‘take home’ the fruits of such research, its ongoing development and applications are shared in some way with the region where they were produced and nurtured. The North East attracts a relatively high proportion of students from other parts of the UK. Figure 4.2 shows the net ‘inflow’ of students to the NELEP region over a six-year period, and also the percentage of all UK-domiciled students studying in the NELEP area who both grew up and studied in this area. This shows a gradual decline in the North East universities’ ‘dependence’ on local students as a proportion of UK recruitment, and an increase in the number who are recruited from other parts of the UK. The North East is becoming increasingly attractive as a place to study for students with roots outside the region. The North East is more successful in attracting students from other parts of the UK than some comparable areas, but lags behind the Yorkshire city regions. Figure 4.3 shows the total number of students who ‘moved to’ the LEP areas that correspond to several northern and midlands city regions, and the net inflow of students to each area as a percentage of total student numbers. While NELEP and the Tees Valley areas have similar figures to that for Greater Manchester and perform notably better than the Liverpool and Greater Birmingham and Solihull city regions, Sheffield and Leeds attract a proportion of students from outside their LEP areas equivalent to between 20 and 30 per cent of total UK-domiciled students. This may reflect the greater proximity of these regions to the densely populated South and South East. The North East, not surprisingly, attracts a high proportion of students from Scotland. Of full-time undergraduate students domiciled in Scotland, 17.4 per cent of those studying in England are at a university in the North East. The only English region which provides full-time undergraduate education to a higher proportion of Scottish students is London, which takes 19.3 per cent of those who elect to study south of the border. The North East remains attractive to Scottish students despite the differences between English and Scottish fee regimes. To support the skills base of a region as effectively as possible, universities need to draw in students from the whole community. Part of this will involve widening their recruitment beyond ‘traditional’ entrants and making higher education accessible through non-traditional routes. Across the UK there are some signs that the mix of entrants to university looks more ‘traditional’ now than it did a decade ago. A higher proportion of UK-domiciled first degree students study full-time (86 per cent in 2014/15, compared to around 65 per cent in 2005/06), and are of ‘traditional’ student age.8 This could suggest that combining work with study to degree level has become less popular. Study on undergraduate programmes other than degrees fell by 56 per cent between 2005 and 2015 (Universities UK 2015), a change which is concerning in relation to workplace skills. Many of the foundation degrees, certificates, diplomas and institutional credit options which have become less popular were used by established workers to upskill while in employment or reskill following redundancy. However, some of the decline may be due to the availability of a wider range of training, including options provided by employers in collaboration with HEIs and other educational institutions. There has also been a fall in the recruitment of students to ‘higher education in further education’ options, which provided a useful route to higher education for non-traditional students. In the North East the numbers studying by this route have fallen gradually from around 11,865 in 2008/09 to 8,350 in 2013/14. The reasons behind this change are not clear. These students might be moving ‘on campus’, or possibly taking up non-HE options such as apprenticeships. Across the UK the proportion of ‘young’ (under 25) first degree students who come from lower social class backgrounds has risen steadily, from 28.2 per cent in 2004/5 to 33 per cent in 2014/15. The North East universities have a good track record of ‘widening participation’, or of drawing in students from social class groups which are traditionally underrepresented in higher education. In 2013/14, 14.1 per cent of their ‘young’ full-time undergraduate students came from neighbourhoods of the UK which historically have a low rate of participation in higher education, compared to 10.9 per cent of all ‘young’ full-time undergraduate students in the UK. This is partly because of the very strong performance by the three ‘post-92’ institutions in recruiting from this group; all exceed their benchmark for such recruitment, with over one quarter of full-time young undergraduates at two of these institutions falling into this category. One of the Russell Group institutions also exceeds its benchmark by a small margin. There has been a small increase in the number of ‘low participation neighbourhood’ students entering HEIs in the region over the past five years. The North East awards a high proportion of research degrees, relative to the number of HEIs in the region, compared to the rest of England. Table 4.1 shows the number of degrees awarded at each level in ‘key’ subjects for the regional economy. * Rank is out of 9. In engineering, the concentration of degree outcomes reflects the areas of specialism identified in NELEP (2014). Maritime, electronic and electrical, and chemical, process and energy engineering account for a particularly high number of research degrees, and the latter field also dominates the region’s output of taught postgraduate qualifications in engineering. The region also produces a high number of civil engineering graduates. Among first degree qualifiers the ‘mix’ is similar, including a comparatively high proportion of maritime technology graduates (this subject is not widely offered at undergraduate level in the UK). In the physical sciences, a high number of research postgraduates also qualify in chemistry and physics. These reflect the areas of specialism identified in the 2014 SEP. The challenge is to ensure that the findings of this research and the researchers developed through the North East universities benefit the region. Chemistry dominates the region’s output at taught postgraduate and undergraduate levels. Graduations in computing and IT are relatively high at undergraduate and taught postgraduate levels, but low for research degrees. The former is encouraging, reflecting the growing importance of digital, software and computing industries in the North East’s economy. A key initiative for the future may be to build on this to follow the lead of engineering and the physical and health sciences in increasing the number of research degrees which can support innovation and growth through KPIs and other frameworks. The region’s high ranking for graduations in languages is largely due to its dominance in classical studies and broadly based language programmes. The number of graduates in modern languages is relatively low, with no specialists graduating from North East universities in Chinese, Russian and East European, Arabic or South Asian studies. However, the figures given here do not reflect combined studies including a language. The other ‘embedded’ factor which is not shown in these figures is specific ‘employability’ development. The structure of courses in higher education as well as some cultural factors around student choice brings challenges for integrating employer demand into university courses. The financial risks of setting up new courses with minimal information about potential student demand are considerable, yet employers may be unwilling to commit to co-funding in the long term or for what are essentially ‘pilot’ initiatives (Hordern 2014). Nevertheless, undergraduate students are increasingly likely to have access to work experience and employability development opportunities, as extra-curricular or elective options. Alongside these, the range of courses whose design and delivery is designed collaboratively between university and industry has expanded. Historically, university courses which prepare and certify graduates for specific types of work were mostly associated with traditional and public sector professions (for example law, medicine, social work, teaching, pharmacy, and so on). The range of programmes whose design and delivery involves some collaboration between university and industry has expanded. Historically, university courses that prepare and certify graduates for specific types of work were mostly associated with traditional and public sector professions (for example law, medicine, social work, teaching, pharmacy, and so on). These potentially offer a model for collaboration with the private sector (ibid). All of the region’s universities now offer options for business development and entrepreneurship, from offering recent graduates advice and ‘hatchery’ space to innovative practical three-year degree programmes (Pugalis et al 2015). The integration of the kinds of ‘underpinning’ skill associated with higher education with deeply practical business activities offers the potential to help build a sustainable long-term ‘ecosystem’ for enterprise and startups in the North East. In recent years a relatively high proportion of students who studied at North East universities have remained in the region on entering employment. Figure 4.4 shows the percentage of students graduating at each level who had entered a job in the region where they graduated six months after leaving higher education. The North East retains 54.2 per cent of its first degree graduates at this point – a higher percentage than in any other English region apart from London, the North West and the West Midlands. For postgraduates the figure is higher, at 69.5 per cent; only London and the North West retain more postgraduate degree leavers. The percentage of those who studied ‘other’ undergraduate courses and who remain in their region of study is, in the North East, the second highest in the UK, at 81.6 per cent; only the North West, at 83.1 per cent, retains a higher proportion. Unfortunately figures are not available for longer-term graduate retention, nor for destinations by subject of study. It is also not possible to determine whether the employment obtained was likely to be related to a long-term career, or whether it was relevant to the student’s first degree. Nevertheless it appears that the North East of England retains a relatively high proportion of the students which it educates. This is particularly encouraging given that the percentage of North East students who are North East domiciled is actually falling. People from the North East who leave the region to attend university are likely to go to the other northern regions: 11.2 per cent of higher degree graduates head for Yorkshire and the Humber and 6.3 per cent to the North West, while 12.4 per cent find their first job in London. These destinations are also the most popular for those leaving an undergraduate course. Similarly the graduates from other regions who are most likely to move to the North East for employment studied elsewhere in the North. Links to the other northern regions, as well as being important for trade, also play an important part in building the region’s human capital. 6 All figures for student numbers and outcomes are taken from the most recent HEFCE and HESA data except where otherwise stated, see HEFCE 2016 and HESA 2015. 7 These figures exclude students studying wholly overseas, but include those studying at the London campuses of Sunderland and Northumbria universities. However, both of these were relatively small at the time to which the data relates, and by no means explain the entire figures. 8 All figures from the Higher Education Statistics Agency (HESA) unless otherwise stated. The number of apprenticeship completions in the North East of England rose from 7,220 in the academic year 2005 to 2006, to more than double that figure (18,040) in 2013/14. Although this latter figure represents a slight fall from over 19,000 in 2011/12 and 2012/13, starts had risen again in 2014 so it is likely that future completion rates will reflect an increase. Figure 5.1 shows completion rates for apprenticeships in different subject areas during the past decade in North East England. Overall trends in completion across the available range of subject areas suggests that apprenticeship outputs are responding to regional skills needs. The growth in business, administration and law may reflect an increasing interest in jobs within the knowledge economy, while steady growth in engineering and manufacturing technologies is also encouraging. The ‘spike’ in apprenticeship numbers in retail and commerce which occurred in 2010 has not continued. Given reported skills shortages in this area, this is potentially concerning. Similarly, future workforce needs in health and social care will require continued growth in apprenticeship take-up. Unfortunately the destinations of apprentices post-completion are not recorded in official statistics. However, if the anecdotal evidence of their similarity to those leaving sub-degree courses in higher education is accurate, then it is likely that many remain within the region. The North East has also seen an impressive growth in achievements in further education. Figure 5.2 (over) shows the number of completions at Level 2 and Level 3 in the region’s further education provision over the past eight years. Between 2005/06 and 2012/13, the North East saw the second-highest rate of growth for any English region in further education attainments at Level 2, with only London enjoying a higher rate. Growth was rather more modest in Level 3 attainments, but even here the North East was the highest-performing northern region. While Level 2 attainments fell for all regions between 2012/13 and 2013/14, in the North East the fall was slightly smaller than elsewhere (at -9 per cent on the previous year, rather than -10 or -11 per cent for most regions). The figures presented here and in chapter 4 demonstrate a strong track record for the North East region in ‘growing’ the skills which it needs for its regional economy, and also in retaining potentially mobile graduates. In the final chapter of this report, we consider how the North East can retain and attract a high-skilled workforce. To retain a highly skilled workforce, a region must offer sufficient jobs to provide both employment and the option of pursuing a whole career in the area. This includes opportunities for advancement within organisations: if the local labour market offers mainly roles within ‘branch plants’ which are at the same level of seniority it is unlikely to be attractive. Similarly there must be opportunities to move between organisations in order to build skills and learning. A frequent criticism of the North East economy is that it has relied too long on a high level of public sector employment. Narrowness in the range of private sector firms is unlikely to have much better outcomes. While the employment projections discussed above are important in determining future skills needs for the region, it is difficult to engage potential employees with this kind of ‘theoretical’ data. Information about where people work now is as important in the choices of, for example, those completing further and higher education. Figure 6.1 shows the percentage of the North East workforce which was employed in roles of each type, between 2004 and 2015. This is encouraging in various ways. Employment levels have risen for professional and associate professional and technical workers, and have remained fairly stable for managers and senior officials. These are the kinds of role which graduates and people with Level 3 skills gained in further education or apprenticeships might be expected to seek. People with relatively low skills may also have additional opportunities due to a rise in sales and customer service, and caring, leisure and service roles. The comparison between the North East and other northern labour markets is also important. The percentage of workers in the managerial and professional groups is greater in both the North West and Yorkshire and the Humber, and has increased in the past few years; in the North East not only do these workers make up a smaller proportion of the workforce, but this has actually declined recently. However, both the percentage of the workforce and the absolute number of jobs has increased for people in the associate professional and technical group. advice on key issues for growing businesses – intellectual property, for instance. The North East had the highest rate of business births outside London in 2014, at 14 per cent. While the rate of business ‘deaths’ is also the highest in England, the survival rate for newly formed enterprises is reasonably healthy (ONS 2015a). Figure 6.2 shows the survival rates for new enterprises in the region for those founded in the five years to 2013. The one-year survival rate is the highest in the UK, while the two-year survival rate is clustered in the highest group, and the four-year survival rate is the highest in the North. There is the potential for new business formation in the region but improved rates of business formation and retention would stimulate the economy and provide a further ‘magnet’ for skilled workers. Research and development investment promotes business growth and provide opportunities for skilled workers. Workers with skills in STEM, business and other areas are also essential to the establishment of an effective research and development base and infrastructure. Currently the sum spent on research and development in North East businesses is relatively small compared to the rest of the UK, even given the small size of the North East population. The distribution of funds between sectors is also surprising, as shown in figures 6.3 and 6.4. The increases in research and development expenditure that can be seen across the UK since the end of the recession are not, for the most part, mirrored in the North East. When expenditure on research and development in the North East is compared with that in other parts of the UK, a disparity emerges between regional share of contribution to GVA and of research and development funding. Figure 6.5 shows the percentage of expenditure on R&D in each UK region for key industrial sectors alongside the percentage of UK GVA for each sector which is generated in that region. This suggests that northern and midlands regions in general tend to ‘lose out’ in R&D expenditure, while southern regions tend to do significantly better. The North East needs to build the number of high-value head office functions located in the region, including research and development. Efforts towards this are under way and can be seen in the increasing levels of innovation and research across the North East. This needs to be sustained, and in particular to take place in small and medium-sized enterprises as well as in larger firms. The best way for the region to build a community of high-value head offices is to grow its own, so that such businesses have a real stake in the region and a commitment to its success. funding for ongoing applied and ‘blue skies’ research; innovation needs to do more than solve pressing problems. The infrastructure for linking skills development to innovation in business, for example through universities, is also crucial. The work of the LEP has made great strides in this area but some gaps still exist. For example, many businesses continue to be unaware of the potential usefulness of knowledge transfer partnerships (KTPs) organised with local universities for driving business innovation and growth. The high success rate of KTPs for North East universities demonstrates that this is a missed opportunity. The North East is often described as an attractive region in which to do business because of the low costs involved: property, land, and labour are relatively cheap compared to the rest of the UK. The lower wages which can be offered in the region are offset by a low cost of living, with house prices and other expenses below those elsewhere in the UK. In fact, in occupations where skilled labour is in high demand there is some evidence that wages may be higher in the North East than elsewhere. Hourly pay for people in associate professional and technical occupations is the highest in the North, while rates for people in technical STEM roles are comparable to those across the region. The implications of this data are mixed. Managers and professionals certainly appear to command somewhat lower wages in the North East than in the rest of the UK, and this remains the case for relatively high-value science and technology workers, the majority of whom are probably graduates. However, the gap between regions is much smaller for technical staff in science, engineering and technology. Across a broad range of occupations, however, the North East also appears from this data to be the ‘lowest wage’ region in northern England. This could make it less attractive to skilled workers who have to choose not between the North East and London or the South, but between different options in the North. Figure 6.7 shows figures for average weekly expenditure on housing in the English regions and suggests that the North East may not, in fact, offer a significantly cheaper lifestyle than the North West or Yorkshire and the Humber. In addition, the ‘low wage/low cost of living’ balance only works for people who are happy to plan a whole career in the north of England. The risk of becoming attractive only to those willing to be effectively ‘cut off’ from working elsewhere should be considered. While the natural resources and non-financial quality of life factors offered by the North East are considerable, the impetus should be to grow the economy so that these combine with a labour market and opportunities to build a career and a lifestyle in the region. A final challenge for the North East is around the ‘softer’ presentation of the region in public discourse and the media (including film and television). Many negative views persist regarding the extent to which the region is ‘cut off’ from the rest of England, and about the persistence of a ‘grim up north’ stereotype. These reflect a mixture of myths, mistakes and outdated positions. For example, the fact that Newcastle can now be reached in less than three hours by train from London still comes as a surprise to many South East residents. However, countering these positions needs to be done with regard for the reality of life across the region, and for the kinds of message which can legitimately and usefully be conveyed to potential residents. Of course, these messages also need to be heard by potential investors looking to locate new businesses, and business functions, in the North East. To make the best use of newly devolved powers for skills development, local policymakers need high-quality and up-to-date information about what skills the North East region lacks. This should include a breakdown for local areas, and for industrial sectors and types of role. And they also need reliable tools for forecasting future skills needs, if the region is to achieve ‘more and better jobs’. Effective measuring and forecasting is itself an area which demands innovation, adoption of best practice, and creative approaches to established problems. The alternative brings the risk of fragmented and reactive approaches, which could leave the North East vulnerable to losing out in the drive to attract investment and build a sustainable economy for the 21st century. skills to help build business infrastructure should also be part of this ‘mix’. Recommendation 2: Skills bodies should encourage a broad base of business collaboration in assessing skills needs and developing training initiatives. Opportunities within the Employer Ownership of Training projects should continue to be pursued, and learning from successful initiatives under this programme (for instance Nissan’s work in the automotive sector, and the Rail Academy) should be shared within the region. This could be done through a range of channels including the LEP. Recommendation 3: Regional ‘sector skills forums’ for employers of different sizes and specialisms within key North East sectors should be established and should meet regularly to decide on concrete actions and priorities for skills. These would feed back to the NECA body and also to those managing specific initiatives such as Employer Ownership programmes. Ideally these should be managed within universities which already bring together training and research and development; the successful maintenance and productivity forums at the AMAP centre in the University of Sunderland could offer a model. New and innovative businesses are crucial if the North East is to attract and retain a skilled workforce and build a modern, sustainable economy. Yet investment in research and development is relatively low, especially in comparison to the region’s contribution to GVA. This is true even in areas where the region has established industrial strengths, such as chemical and transport manufacture. The North East has strong assets to support the creation of innovative new businesses, including its universities and their well-established links with local businesses. Policies to maximise their impact will help the North East build a labour market which attracts and retains skilled workers. Recommendation 4: The national government should consider incentives and reward for companies that can demonstrate an investment in building a skills ‘ecosystem’ in regional economies beyond their own needs. Recommendation 5: To support the development of startup, family and microbusinesses into larger enterprises, training and development should be designed and offered. This could include specific advice on finance, intellectual property, leadership and management training, and training for boards of directors. Recommendation 6: To improve and streamline opportunities for finance to startup companies, a body modelled on Scottish Enterprise should be created by NECA. This would provide a high-profile ‘Route 1’ offer which is well known and easily accessible for entrepreneurs and potential investors, and which brings a strong regional identity for companies. Recommendation 7: To support the retention of postgraduate research students in the region and the contribution of knowledge transfer partnerships (KTPs) to regional research and growth, a single body should be set up to promote KTPs with North East universities. This would proactively promote the advantages of KTPs to businesses, set up links between businesses and university departments where there is the potential for a successful collaboration, and support the establishment and ongoing management of the KTP. Engagement in education and training depends to a large extent on a good understanding of how these can help in getting a job and building a career. There is some evidence of gaps in awareness of this relationship within the North East, and also of out-of-date perceptions of the regional labour market and the opportunities it presents. Gender stereotyping continues to limit the pool of talented young people entering STEM courses and occupations, and older workers may not access the upskilling or retraining which would benefit them as individuals and the wider local economy. ‘scopes’ and specifically addresses problematic misunderstandings, such as ‘out-of-date’ assumptions about particular kinds of work. Recommendation 9: The NECA body and other stakeholders should work with established projects (for example Athena Swan, Women in Science and Engineering, the Open University) to engage learners who are potentially ‘lost’ from the region’s talent pool, such as women in STEM, or older workers who are unaware of opportunities to reskill. Recommendation 10: To support exporting industries and in particular to foster cultural awareness that will help to grow long-term business links, integrated training in modern language skills should be established and made available to universities, schools and businesses.